Expecting two peas in a pod? Neat and very unique, our handpainted set of two peas in a pod ceramic salt and pepper shakers is the perfect favor for a twins baby shower. What could be cuter?! 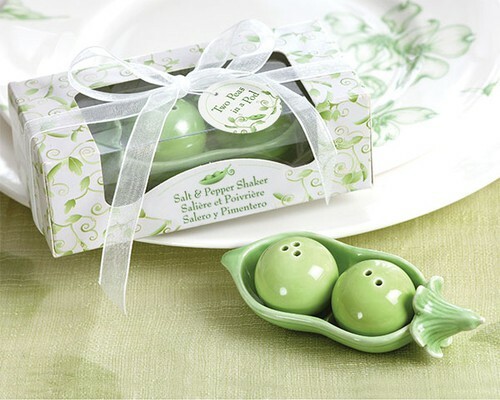 Detailed and dainty, this shaker set is leafy green and reusable time and again. The shakers come packaged in a lovely gift box decorated with curling ivy vines and a clear window in front for a precious presentation, complete with a white organza ribbon tied in a bow. Salt and pepper shakers are removable from the "pod". Shaker set measures 4" long, each shaker is approximately 1 inch in diameter. Box measures 4 3/4" long x 2 1/4" x 1 1/2" tall. Celebrate twins! 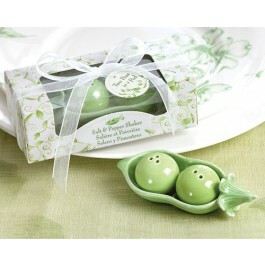 A perfect match with our "Two Peas in a Pod Partyware"